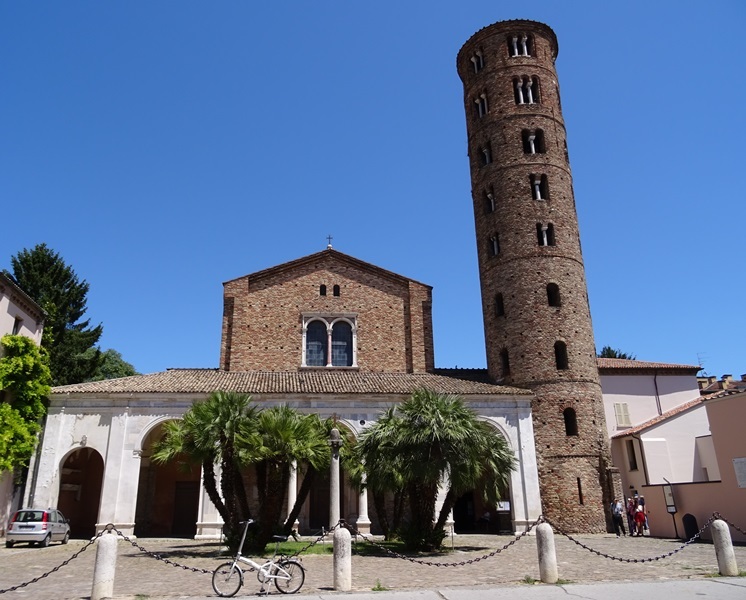 The Sant’Apollinare Nuovo is an early sixth century church in the centre of Ravenna that is renowned for its beautiful wall mosaics. 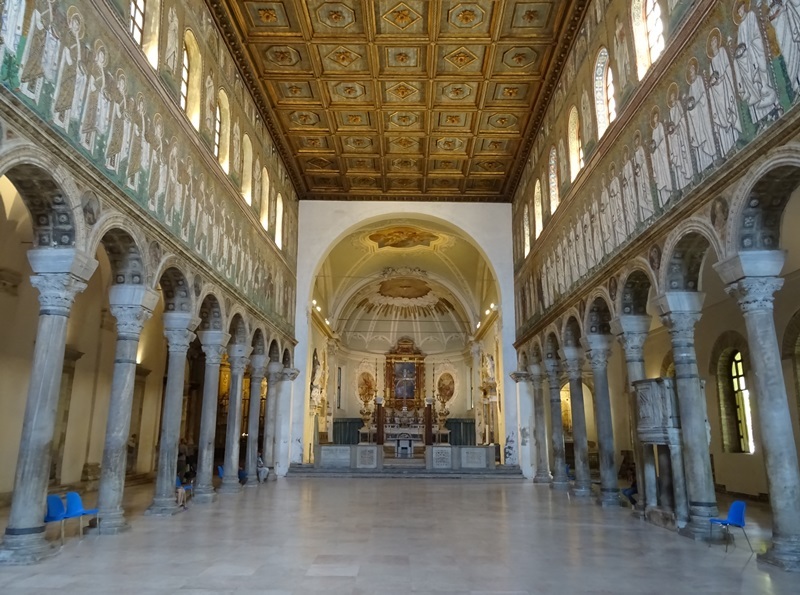 In fact, it is one of only two churches in Italy of which the original wall mosaics have been preserved over the centuries, the other being the Santa Maria Maggiore in Rome. Originally, the apse would have been adorned with mosaics as well, but it collapsed during an earthquake in the eighth century, and as a consequence, the mosaics were lost. The wall mosaics are interesting not only because of their beauty, but also because they were altered dramatically when the church was rededicated to Orthodox Christianity after the Eastern Roman Empire reconquered Italy from the Goths. The purge of the mosaics is a story that deserves to be told in some detail. The Sant’Apollinare Nuovo was built during the reign of the Ostrogothic king Theoderic, who was the supreme ruler of most of Italy between 493 and his death in 526. The Sant’Apollinare was an Arian church, with Arian worshippers rejecting the Orthodox doctrine of the consubstantiality of God the Father and Christ the Son. Christ had been created by God and was therefore subordinate to the Father, not “of the same substance” as Orthodox Christians believed. The Sant’Apollinare is often called Theoderic’s palace church, and indeed the royal palace was located directly to the south of the basilica. It seems that a door in the southern aisle of the church led directly to the palace grounds. Under Theoderic, the church was presumably dedicated to Jesus Christ himself. When the Eastern Roman armies had retaken Italy from the Goths, the basilica was rededicated to Orthodoxy by Agnellus, archbishop of Ravenna from 557 until 570. The rededication probably occurred somewhere in the 560s and also involved the dedication of the basilica to a new patron saint, in this case Saint Martin of Tours (died 397). Martin is of course best known as the Roman soldier who shared his cloak with a beggar. He later left the Roman army because he considered serving in the military to be incompatible with his Christian beliefs. Martin became bishop of Tours in the 370s and was known for his opposition to Arianism (see Milan: Sant’Ambrogio), so Agnellus obviously chose Saint Martin for a very specific reason when he reconciled Theoderic’s church to Orthodoxy. Agnellus was also responsible for purging large parts of the walls mosaics in the basilica, an event that I will discuss below. During the reign of archbishop John V (726-744), the apse of the church collapsed after an earthquake. The Baroque apse that we see today was constructed in the sixteenth century and, in my honest opinion, does not match well with the rest of the church. It is a pity that we do not know how the original apse was decorated. 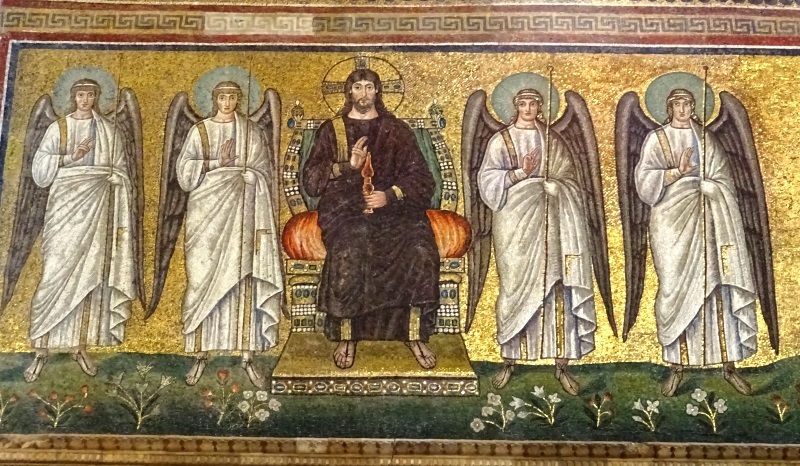 We can be certain that both the apse and the triumphal arch were adorned with mosaics. Information about these decorations would make interpretation of the surviving wall mosaics, which is incredibly difficult, somewhat easier. Saint Martin leading the procession of male saints. In the ninth century, the coastal regions of Italy were frequently attacked by Arab pirates. 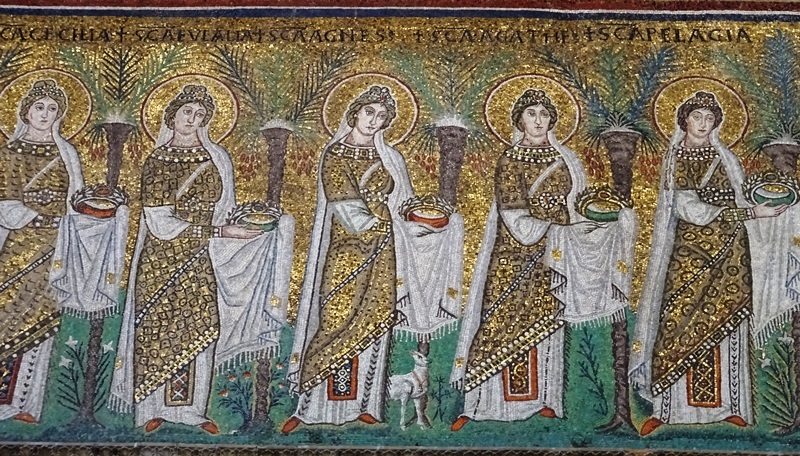 It was presumably in this period that the relics of Ravenna’s traditional first bishop, Saint Apollinaris, were removed from the basilica of Sant’Apollinare in Classe, which was considered too vulnerable, and taken to the church of Saint Martin in Ravenna. The church of Saint Martin was subsequently dedicated to Saint Apollinaris and renamed the Sant’Apollinare Nuovo, the “new” Sant’Apollinare, to distinguish it from the “old” Sant’Apollinare in Classe, some five kilometres to the south. The new name is confusing, because the “new” church is actually a few decades older than the “old” church, which was commissioned by bishop Ursicinus (533-536) and only consecrated in 549 by one of his successors, archbishop Maximianus (546-557). The visitor enters the church on the west side, which is decorated with a simple sixteenth century marble porch. To the right of the porch is a cylindrical campanile dating to the ninth or tenth century. Once inside, the visitor is easily struck by the beauty of the wall mosaics, which are divided into three zones. We see processions of male and female saints in the lower zone, standing male figures with scrolls and books in the middle zone and a Christological Cycle with 26 scenes from the life of Jesus Christ in the uppermost zone. The lower zones immediately catch the eye. The north wall – i.e. the wall on the left – shows a procession of female saints led by the Three Magi. They are leaving a walled town labelled CIVI(TAS) CLASSIS and are processing towards the east where, next to the original apse, we see a seated Madonna and Child surrounded by two angels on either side. The female saints are all carrying crowns to the Madonna and Child. They are labelled – from SANCTA EVFIMIA (Saint Euphemia) to SANCTA EVGENIA (Saint Eugenia) – and they all look much the same. There are a few slight differences between the women – in hair colour, dress and facial expressions – but overall the composition is quite monotonous. The only woman who somewhat stands out is Saint Agnes, who has a lamb at her feet. Although the name ‘Agnes’ actually means ‘pure’ in Greek, it was quickly associated with the Latin word agnus, meaning ‘lamb’, and Saint Agnes is usually depicted with a lamb in Christian art. It can be no coincidence that the archbishop who rededicated the church to Orthodoxy and who – as we will see – was also responsible for the creation of this procession – was called Agnellus, or ‘little lamb’. Of course, the Three Magi look quite different from the women. They are wearing colourful eastern robes and the familiar Phrygian caps. 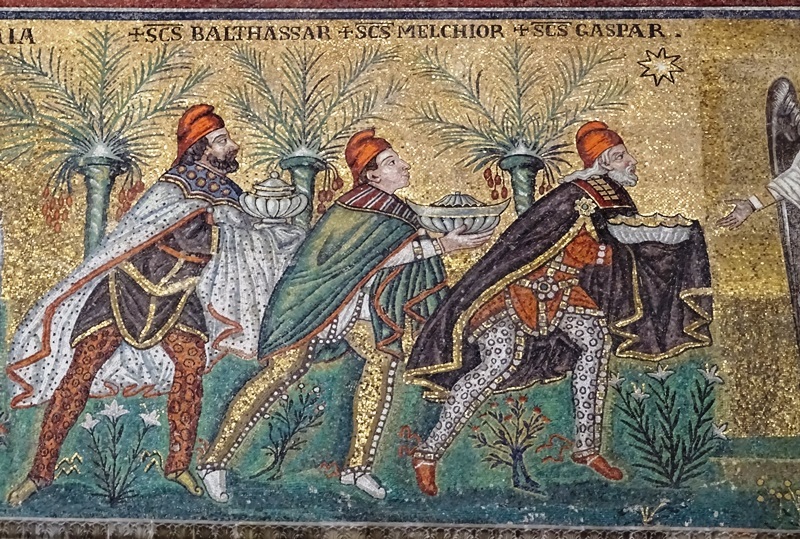 The Magi are not carrying crowns like the woman do, but are presumably holding the gifts mentioned in the Bible in their hands: gold, frankincense and myrrh. In the top right corner, the Star of Bethlehem can be seen. The Magi were not part of the original composition. 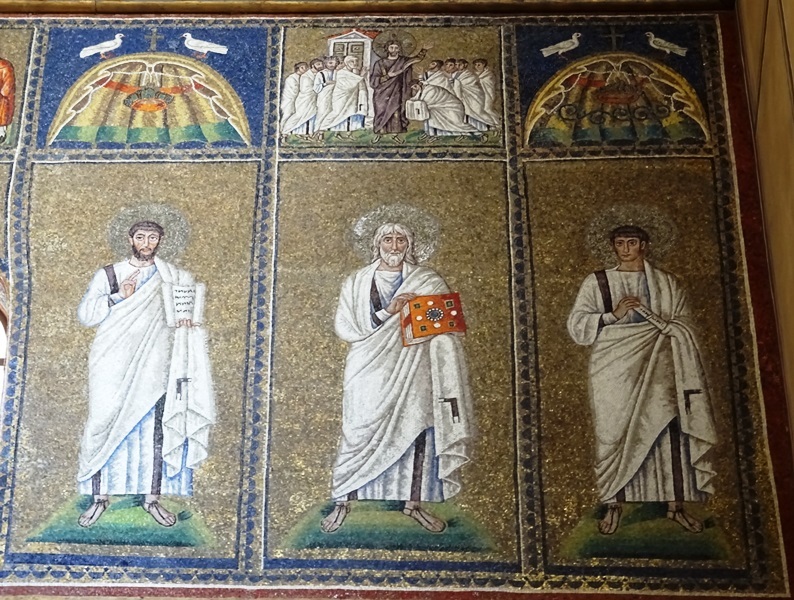 They were added after the mosaics in the palace church of Theoderic were purged, and the fact that there are three of them can be seen as a reference to the Holy Trinity, and thus as an anti-Arian statement. On the south wall – i.e. the wall on the right – we see a similar procession of male saints (see the image above). The men are processing towards the east from a walled city labelled PALATIVM and CIVITAS RAVENN. There are 26 of them, and they are led by Saint Martin of Tours. Saint Martin is followed by two popes, CLEMIS (Pope Clemens; 88-99) and SVSTVS (Pope Sixtus; 115-125). The CORNELIVS who is in sixth position was also a pope (Pope Cornelius; 251-253). Madonna and Child on the north wall. Compared to the women on the other side, there is slightly more variation. Some of the men have beards while others are clean-shaven. Saint Cornelius is holding his crown with just one hand and is pointing his right hand at the man behind him, Cyprianus of Carthage, who was a friend and ally during the so-called Novatianist Schism in the 250s. The man in fourth position is notable because he is wearing a golden tunic under his white mantle. The man is Saint Lawrence, whose cult was very popular in Late Antiquity, as we have seen previously. Of course, Saint Martin at the head of the procession also stands out because of his purple mantle. 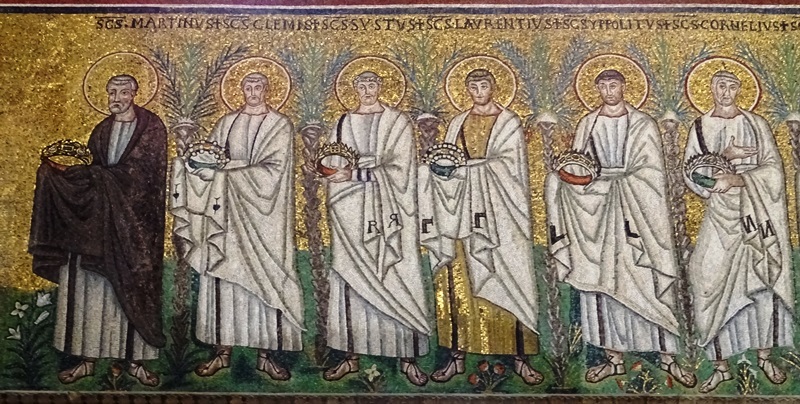 Also included in the procession are saints who had a close connection to Ravenna: Vitalis and Apollinaris himself. 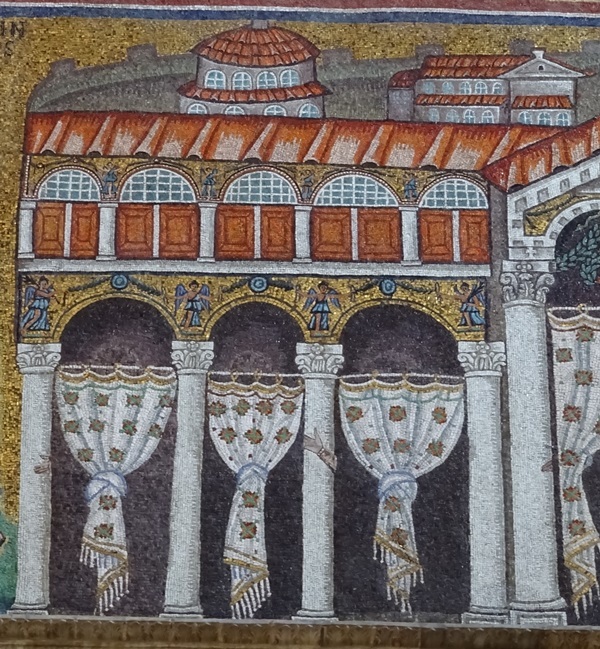 Many of the mosaics in the lower zone were altered drastically after the rededication to Orthodoxy in the 560s. The mosaics of the Palatium and Classe were modified and the zones between the Palatium and Christ and between Classe and the Madonna were almost completely erased. Whatever was there originally was replaced by the two processions of saints, including the Three Magi. It has been speculated that the middle part of the mosaic portrayed a procession of Theoderic and members of his court before it fell victim to Agnellus’ hammers and chisels. However, as Deborah Mauskopf Deliyannis has forcefully argued, this imagery would have been without precedent and merely relies on weak assumptions. We can never know what was on the nave walls in Theoderic’s time, but it was surely considered offensive to Orthodox worshippers and needed to be “taken care of”. In the second half of the nineteenth century, the Roman artist Felice Kibel (1814-1872), who also worked on the Orthodox Baptistery, was charged with restoring the mosaics of the lower zone. These were probably in a bad state, and parts of for instance the Classe mosaic were missing altogether. Although the mosaics are now complete again, it is certain that Kibel made changes to the original composition and added elements of his own. The fact that, already in the sixth century, changes were made to the images is impossible to hide: in some places it clearly shows. Sometimes this was probably because of haste or a lack of skill on the part of the mosaicists who were employed by Agnellus. 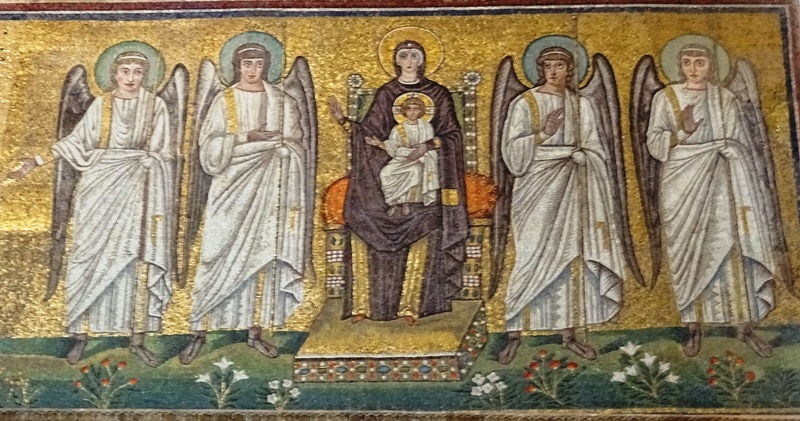 For instance, the ground line in the zone between the Three Magi and the two angels to the right of the Madonna and Child (the visitor’s left) clearly changes and becomes much lower (see the images above). The mosaics here were simply crudely done. Hands on some of the columns. However, if we take a closer look at the columns of the Palatium, we see fingers, hands and parts of arms on some of them. The body parts presumably belonged to figures representing Goths and/or Arians who were holding their hands up in the orans position. It is claimed, with some justification, that these elements were left in place on purpose, precisely to show to churchgoers that they had been erased. Both the Palatium and the Classe mosaics have sparked a lot of academic debate. The Palatium (see above) has been compared to the apse mosaic of the Santa Pudenziana in Rome, which also shows a colonnaded gallery with buildings behind it. Does the Palatium represent Theoderic’s real-life palace or is it simply an idealised image? Are the buildings behind it, surrounded by the city walls, real buildings in sixth century Ravenna or are they ‘just buildings’? What does the gate at the right side of the palace represent? These are all questions that we simply do not have the answers to. In any case, the mosaicists saw no need to erase the entire palace. Even if it was Theoderic’s palace, this building (i.e. the real palace) was reused by the representatives of the emperor in Constantinople, the exarchs, and it would therefore not have been considered offensive. 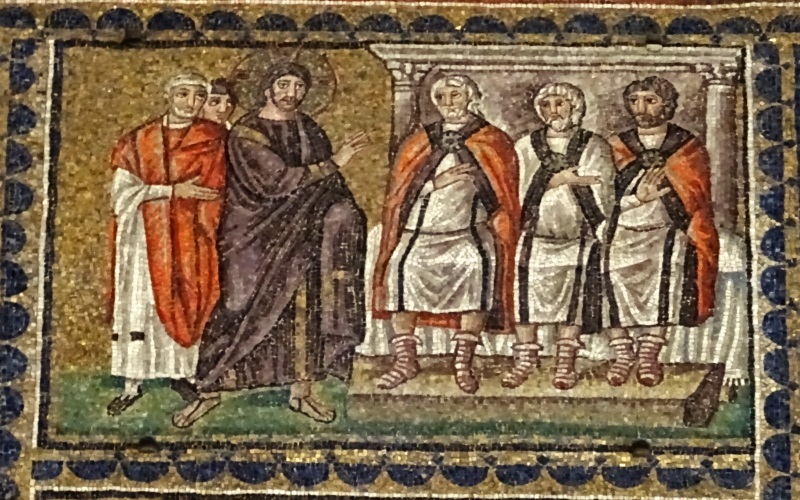 The Classe mosaic (see above) was also altered. The ships on the left are original and refer to Classe’s important function as a port. The ships are clearly merchant vessels, not warships, as is demonstrated by their round hulls. The left part of the wall is also original, but most of the top right part is a reconstruction by Kibel, including most of the text above the gate. Shadows of five figures standing in front of the wall have been identified and these were erased and replaced during Agnellus’ purge in the 560s. As with the Palatium, the question is whether the buildings of Classe represent real buildings or were merely included for artistic purposes. Felice Kibel also worked on the part of the wall mosaic where Christ and Saint Martin are depicted. The right side of Christ is a restoration. He is now holding a sceptre, but may have originally held a book with the text “Ego sum rex gloriae” or “Ego sum lux mundi”, the same text that we find in the Duomo of Pisa. The angels on Christ’s left are also reconstructions, and so is a large part of Saint Martin. Part of his shoulder and back are original, but the crown in his hands is Kibel’s addition and we cannot know whether he held a crown in the original mosaic. Of the Three Magi on the opposing wall, the parts below the waist – i.e. the splendid Persian trousers – are still original, but the upper parts are nineteenth century reconstructions. Mosaics of the middle zone. The middle zone does not warrant a lot of discussion. We see 32 men dressed in tunics and mantles. Some of them are young, others are old. Some have beards, others are beardless. They are all haloed and are carrying scrolls or codices, either opened or closed. None of them are labelled, and they do not seem to represent specific persons, unlike the male and female saints of the lower zone. The men have been interpreted as prophets, evangelists, patriarchs, biblical authors or members of the heavenly court surrounding the Christ and the Madonna below them. They were apparently not included in Agnellus’ purge. The scenes about his ministry show Christ as a beardless young man. In the 13 scenes on the opposite wall, he has a beard and seems older and more mature, much like the Christ of the lower zone. Included in this post are three scenes from the Passion: Christ on trial before the High Priest and the Sanhedrin (right image), the Last Supper (image below) and Christ being led away to his crucifixion (far right image). The crucifixion itself is not included in the cycle. The imagery of the Last Supper is particularly interesting. 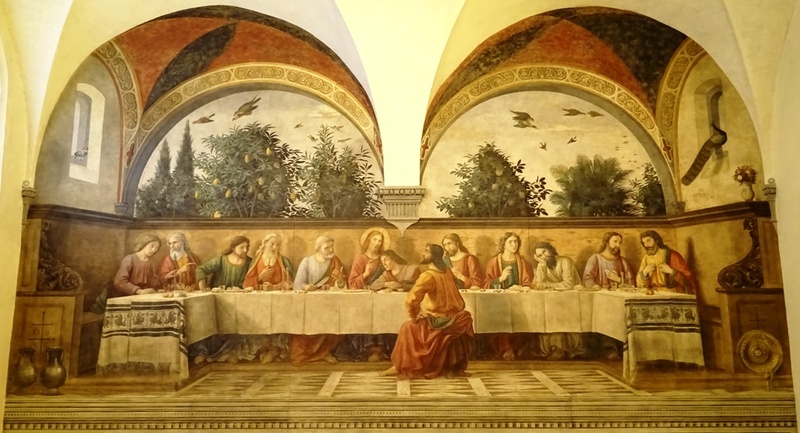 Of course we all know the depictions from the Late Middle Ages and the Renaissance, with Christ and his disciples seated behind a long table. 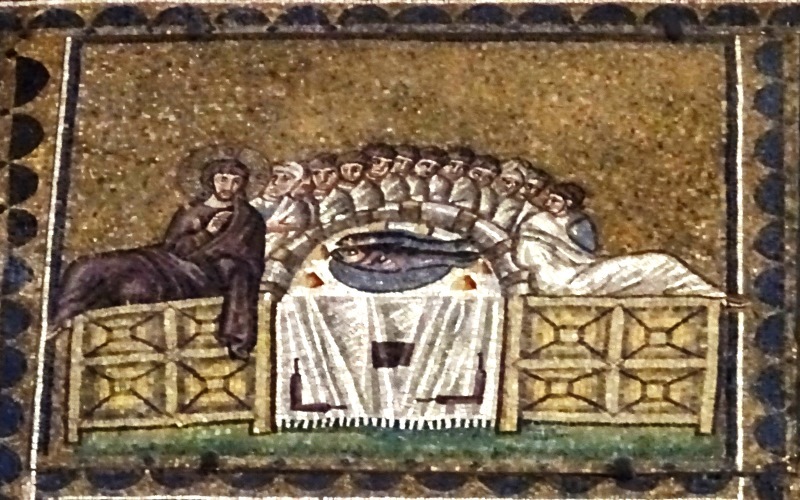 Here, Christ is not in the middle, but at the left of the table, and he and his followers are not seated, but reclining on couches in the traditional Roman fashion. Two huge fishes are on the small table. 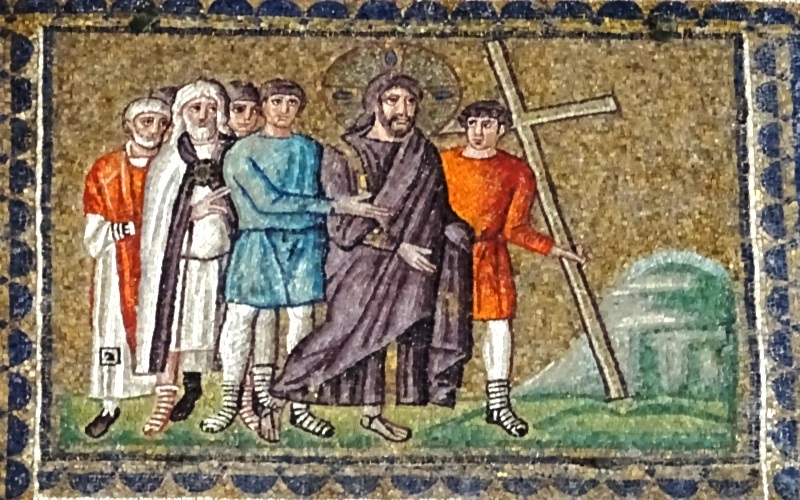 Near the entrance of the church, fastened with a nail to an otherwise undecorated brick wall, we find a small mosaic of a man in imperial robes, who is labelled IVSTINIAN. It is quite reasonable to assume that this man is indeed Justinianus, the Eastern Roman emperor (527-565) who was responsible for the reconquest of Italy. When Theoderic died in 526, he was succeeded by his grandson Athalaric. Since the latter was just eight years old, his mother (and Theoderic’s daughter) Amalasuntha acted as a regent for him. She was quite capable – and may have donated the Temple of Romulus and the Bibliotheca Pacis in Rome to the Pope -, but made many enemies among the Gothic nobility. Athalaric died in 534 while still a teenager, and Amalasuntha proclaimed herself queen. She intended to rule jointly with her cousin Theodahad, but the latter and a large part of the Gothic nobility imprisoned her and ultimately had her murdered in 535. Since she had appealed to Constantinople for help, Amalasuntha’s arrest and murder presented the emperor Justinianus with a pretext for war. The emperor’s military intervention in the same year led to a series of armed conflicts, usually called the Gothic War (535-554), which devastated Italy and led to the demise of the Gothic Amal dynasty and the re-incorporation of Italy into the Roman Empire. The mosaic was restored by Felice Kibel in 1863, and it was Kibel who added the label IVSTINIAN. Some historians have speculated that the figure may have originally been Theoderic, who was subsequently altered to represent Justinianus. While this is not impossible, it cannot be proven. 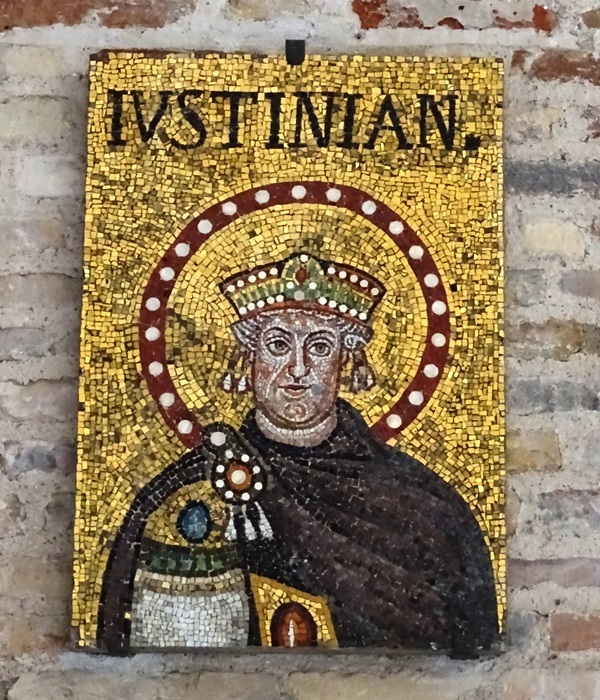 It is true that this Justinianus does not look anything like the Justinianus in the San Vitale elsewhere in Ravenna, but then again if the man in the image is indeed Theoderic, he does not look anything like the Theoderic of the Senigallia medallion. Of course portraits on coins and in mosaics were not meant to be precise images of living persons, and the fact that ninth and sixteenth century sources mention the presence of a portrait of Justinianus in the Sant’Apollinare probably makes it safest to accept that we are dealing with the famous Eastern Roman emperor himself here.